GABRIEL- a Great Pyrenees & a Great Dog. 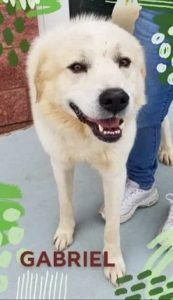 He was rescued from a neglectful situation- About 4 yr. & relatively small for a male Pyr. He has the breed trademark, double back dewclaws. Great Pyrenees are not big Golden Retrievers. They were bred for a different function. Pyrs are a working breed developed in the mountains of France to guard sheep. Our GABRIEL loves people & walks well on a leash. He is not a fan of other dogs. GABE would do best in a one dog, breed-savvy home. This entry was posted in Adopted, Adopted Dogs, Adult, Dogs, Male. Bookmark the permalink.